Free Printable April 2016 Photo Calendar Template. Free Printable April 2016 Photo Calendar Template for MS Word. 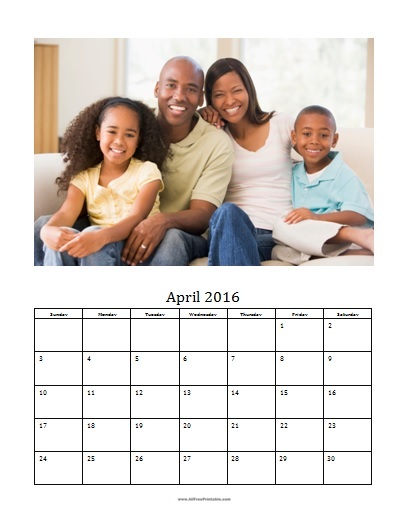 Personalize your own April 2016 photo calendar by adding your family photos and writing important things to do before you print. Great calendar for the office, classroom or home. Just download the template and change the sample photo. You can insert family photos, beach girls, celebrities, beaches, nature, pets, sunset, seasonal photo and more. To do this just right click and select change picture, select your photo and insert. If the calendar is messed up just right click the new image and from text wrapping select behind text and position where you want it to fit using the frame as guide. Use the link below to download the Microsoft Word Template.